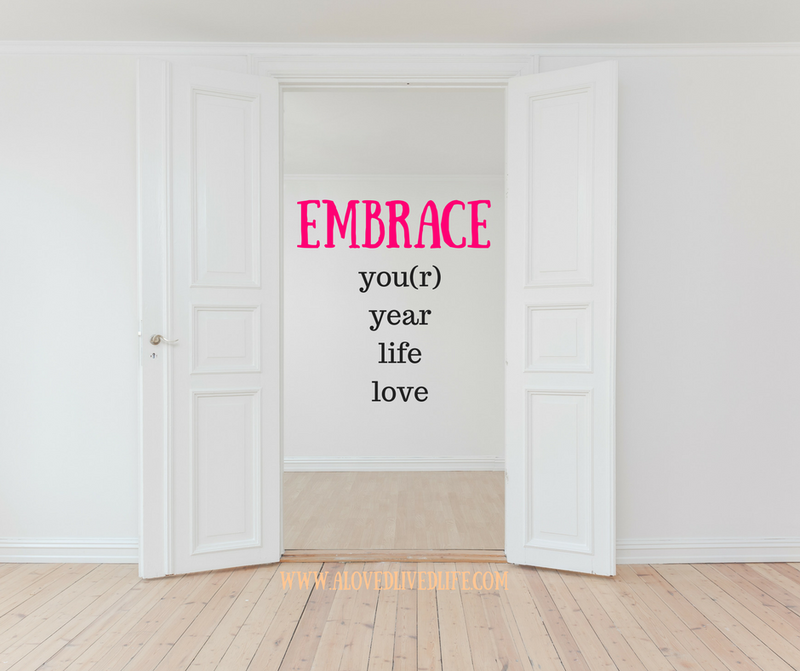 What does Embrace 2018 look like? Embracing your year means starting with yes! It means, accepting what comes to you, good and bad. Looking for that silver lining in the challenges, how can they help you learn and grow? Being grateful for the good things, instead of disappointed in the parts that aren't perfect. Have you ever fixated on the negative? Let's say you sit down at a meal with your family and the chicken is perfectly cooked, but the brussels sprouts are mushy. You sit there and stew on the brussels sprouts. Why are they mushy? Who serves brussels sprouts anyway? You hate brussels sprouts! Embracing means focusing on the fact that you are sharing a meal with your family. You are taking time out of your busy life to nourish your body and soul. And that chicken is awesome! And you bet you can find a better recipe for brussels sprout, a perfect chance to check out Pinterest (after the meal, of course). Embrace means welcoming what comes to you with open arms. You don't need to worry or protect yourself. You trust yourself! You've got this! You look for the beauty. You recognize when things aren't going your way, big or small, that doesn't mean everything is terrible. You mine the nuggets of gold in the muck. After all, as the saying goes, without the rain there wouldn't be rainbows. Right? Embrace also means, embrace yourself. Practice self compassion. The new year is a time when we set many resolutions, often about weight loss, and many times we fail. Embrace means that if you fall short of your goal, you avoid berating yourself and thinking that you're a loser. Instead, look at what went wrong and what went right and plot a new course. Tomorrow is a new day! I got the chance to embrace our new mantra yesterday. I was leaving a meeting and heading home. I chose between taking surface streets or getting on the freeway. Normally, I am a surface-streets-all-the-way kind of gal, but for some reason, I decided on the freeway. Even though it was 5:00 on a Monday. As I neared the turn lane to enter the freeway it was backed up quite a long way. It took two light cycles to make the left turn onto the road. And once on there the traffic crawled along. Like most people, I hate traffic. And I hate when I make a bad decision that inconveniences me. But yesterday, I embraced the traffic as an opportunity to practice patience and made a mental note that there's a reason I take the surface streets. Embrace! How will you embrace 2018? Do you have a mantra for the year? We would love to hear from you in the comments. Just keep moving forward is my mantra for 2018. Thanks for blogging again, my friend. Love it! Can’t wait to read more blogposts! !